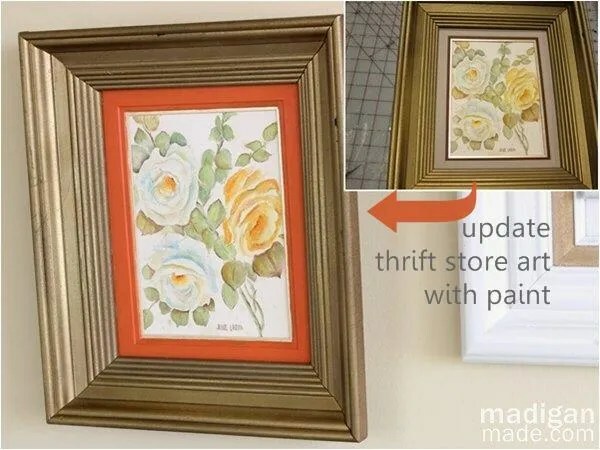 Madigan made… DIY wall art with a simple update to thrift store finds. Have you ever looked at an object at the thrift store and thought it was kinda cute… but you were not 100% in love with it? Don’t pass that thing by without considering what simple modifications you could do it. And sometimes, all that piece needs is a little tweak to make you crazy about it. I am working on a gallery wall installation above the slipcovered futon in my home office. I already showed you the balloon inspired wall plaque and my grandmother’s illustrations (how I made one look like a oil painting and the other one I layered onto of another frame for more impact). Those pieces are already on the wall. Well, this past year I found three random objects at thrift stores. I knew with a little tweaking, they could work in the room. If you remember, the colors I am using in the room are green, aqua and orange. I found a floral brooch, floral painting and flower shaped plates this past year. I updated all of them using a little glass paint. Yep, glass paint. I have a ton of glass craft paint in my craft stash. I’ve received various bottles of glass paint for prior sponsored projects in the past (here, here and here). I used the paint in the traditional sense…. To paint glass. But did you know you can use glass paint for other things, too? I like how glass paint has a translucency and sheen to it… It adds dimension to something that regular craft paint can’t do. And these three pieces just needed a little boost in color… I did not want to completely cover things up. When I looked at this brooch, I loved the green colors in it. It complemented the room’s color scheme. But the yellow did not quite work for me. So, I used a little translucent orange glass paint over the yellow areas. Most of the time when I look at homemade art work in the thrift store… I’m disappointed. I usually find ugly or banal works… or they simply are the wrong subject matter. But I couldn’t resist this little painting when I saw it. The floral subject of the watercolor was pretty and it included the colors I wanted in the room (orange, blue and green). Plus, I loved the chunky gold frame! But the impact of the colors in the painting was not quite strong enough for me. It was too peachy and washed out. So, first I used regular craft and changed the color of the matte to orange. Then, I grabbed some glass paint and lightly painted over some of the colored areas on the flowers and leaves. You can still see the brush strokes and subject matter underneath….but the colors are now a little more saturated and brighter with the glass paint over top. The change is subtle, but just enough! When the saucer and dessert plates were stacked on top of each other, I thought it looked like a flower. So, I used some E6000 adhesive and glued the plates together. I used more glue to attach them to a round wood plaque that I painted aqua with regular craft paint. To create a “center” for the flower, I used three dimensional, frosted glass paint. I put little dollops all over the center to add texture that looked a little like seeds when dry. I love the way these three pieces look on the wall together. I almost past by these items when I was shopping… but I’m so glad I did pick them up! I’ll be showing you more of this gallery wall soon… But I hope this section of my display inspires you not to pass up that “I don’t know… it’s kinda cute… but…” object at your next garage sale or thrift store! Could you tweak it a little with paint?